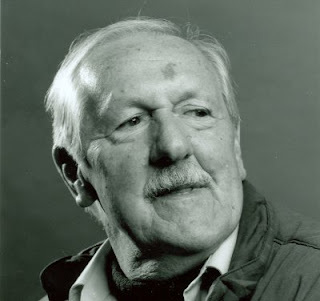 Brian Aldiss (b. 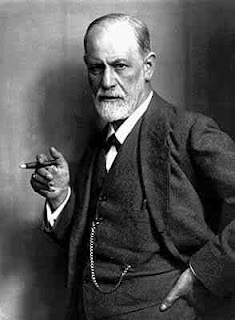 1925) can be a little crotchety at times. As a critic, he coined the term “cosy catastrophe,” a derogatory epithet for the writing of fellow Brits like John Wyndham. As a novelist, Aldiss’ characters are often grey morally and his view of society is unpleasant. His narratives don’t end wrapped up with a pretty bow. 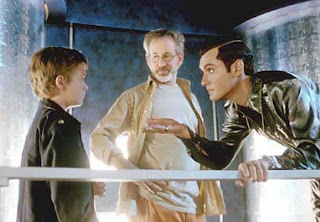 That’s why one of the great travesties of contemporary sf filmmaking for me is the mess Stephen Spielberg made of Aldiss’ short story “Super-Toys Last All Summer Long.” For instance, one of the minor bits from the story that didn’t make the film was Aldiss’ description of the consuming habits of the rich. In the future, through the help of nanotechnology, the rich consume vast quantities of food without losing perfect form. Expensive microparasites make sure of it. So while the developing world unravels because of food shortages and the poor of all nations go hungry, the rich eat more than any human being should and previously could. Ah, the decadent West. 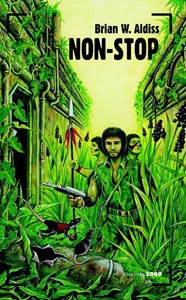 Non-Stop came out before “Super-Toys.” In fact, it’s one of Aldiss’ first novels. But like STLASL, it doesn’t let society off the hook. The narrative follows hunter Roy Complain of the Greene Tribe–a group that is decidedly fearful of the outside world. When he becomes ostracized within the tribe, Complain is convinced by religious leader Father Marapper to go exploring with a motley crew of thugs and misfits to see what’s out beyond the land of the Greene Tribe. Actually, Marapper has a pretty radical idea. He’s convinced that all the known tribes live in an enclosed world called a ship and that this ship is not the natural habitat of humans. He even has a map to prove it. Marapper’s group works its way through the “ponics,” a thick vegetative growth that encompasses many areas of the…well hell, I’m just going to tell you…the spaceship that they live in. See, all the tribes are the descendants of the original crew of a generational starship. But something went wrong. They’ve been traveling for too many generations and are thought by those in the know to have passed by or gone in the completely wrong direction of their destination planet. While adrift, the inhabitants have forgotten their origins and civilization has devolved into primitivism. And the reason they haven’t reached their destination is the real shocker of the novel, not the fact that the place is a starship (which is revealed on page 28). I mention this only because folks blew a gasket when the novel was retitled Starship in its first US printing. Too much is given away about the plot in the title, they said. Anyway, Marapper’s group ventures through the ponic-filled “Sternstairs,” “Quarters,” and “Deadways” to the “Forwards” area of the ship. The pieces really start coming together there. They find out about the “Giants” who built the ship and who seem to have returned. They learn the secret of the control room. And they find a lost captain’s log that details the beginnings of “The Teaching”–the religion of the ship–, which is a distorted, mythologized version of psychoanalytic theory. (All praise to its prophets Froyd and Yung.) Complain, Marapper, and the boys also find lots and lots of rats. Super-smart mutant rats that live in rat cities and lord over creatures of lesser intelligence. Creepy. Aldiss’ big shock ending doesn’t make one feel comfortable. And his characters certainly aren’t heroes. Marapper is a megalomaniac, Complain’s morality comes from his crotch, and the Giants are, among other things, patronizing. He also makes the idea of generational space travel downright sick and twisted. It’s just my kind of sf story! In print: a blessing because Aldiss is not as revered in the States as he is in the UK. This entry was posted in 100 list, film, john wyndham. Bookmark the permalink.